Crispy on the outside and soft in the middle - these cookies won't last long! The sweet heavenly scent will fill your home as they bake! 1. Preheat the oven to 180◦C, (160◦C for fan ovens), Gas Mark 4. 2. In a large bowl, cream the butter, sugar and condensed milk until pale. Mix in the flour and then work in the chocolate. 3. Take a small handful of dough and flatten with your fingers. Place 2-3 raspberries into the centre of the cookie and squash the dough back into a rough ball. Repeat with the remaining dough. 4. Place onto parchment lined baking trays, spacing well apart and bake for about 15-18 minutes or until golden brown at the edges, but still a little soft. Leave to cool slightly and set before transferring to a cooling rack. You can freeze the dough complete with raspberries and chocolate in small mounds ready for baking straight from frozen! Or keep the dough plain and refrigerate for a week or so. For allergens, always check the ingredients list of each product used. Recipe contains gluten, milk and soya. Hi Sarah, what a treat! This will take a little longer to cook. Our recommendation is to put it into the oven at the 180C temperature for 10 minutes then turn the oven down to 160C for another 10 minutes. I made some for the office and they were so popular that that I was given some orders! These cookies are to die for! 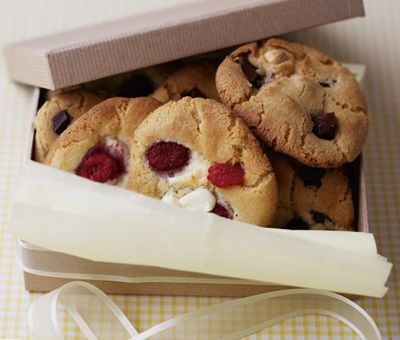 You just need to be a bit careful with the raspberries as they can make the cookie a bit too soft in parts. I would recommend doing smaller cookies with maybe just one raspberry in. Absolutely delicious recipe though and so easy to make. I for one, will be making them again and again (goodbye waistline!) and am going to try a few different variations. Yum! These cookies are so delicious! I substituted raspberries for cranberries and made them as a Christmas gift for my children's school teachers, they were a hit! Also chilled the dough for a bit, they turned out perfectly and didn't spread too much. Thanks for the fabulous recipe will definitely be making these again! Hi Becky, what a lovely twist on a favourite. We haven't tried it but it sounds delicious if you are feeling adventurous. I would recommend substituting 170g caramel for the condensed milk. My 1ST batch of these cookies were great and were chewy. But when I decided to make more but with different ingredients and lessened the time (about 15 mins then adding minutes if required) they all came out soft but cooled down hard. How soft do they need to be when I take it out the oven? Cos when I 1st check on then my finger could just go through it with hardly any pressure. Hi Victoria, glad to hear you enjoyed this recipe. We love these cookies. The secret is to cook them until they just start to go golden brown. They will still be soft but the sugars will crisp up when they cool and the centre should stay soft. I have made these several times now, for home and for work, but to save time I mixed the raspberries in with the dough, giving the cookies a swirled raspberry ripple effect. when mixing in you dont need as many raspberries. Hi Millie, good news yes you can! Our cookies do spread - you can make them spread less if you add a little tiny bit more flour - try an extra 25g for a stiffer dough. We like big cookies but its up to you how big you make them! Happy Baking! These are gorgeous! i used three quarters of the ingredients as didn't have enough flour, but still made plenty.i didn't have fresh raspberries, so used a handfull of dried cranberries that i had left and threw in some chopped glace cherries. They're really easy and quick too. i thought I'd overcooked some of my first batch I'd baked, but even they tasted nice, almost caramalized! This makes the most delicious cookies I have ever tasted! However I found they were very soggy around the raspberries. I changed the raspberries next timefor a packet of raspberry flakes (like the ones for children's lunchboxes) and it worked perfectly! Hi Ruth, the raspberry flakes sound like a great alternative. We find some have their own preferences and twists to our recipes which is great. Delicious Recipe ... I used dried cranberries instead and the result was just as yummy!! Absolutely delicious cookies and so easy to make, would thoroughly recommend. Raspberry and White Chocolate Chunk Cookies is rated 4.5 out of 5 by 11. Rated 4 out of 5 by Kath from Looks as good as the image! The cookies taste great and look just like the photo given! I would add more flour though as the raspberries make the mix quite moist. I found that mixing the raspberries into the mixture (with the chocolate) tasted better because the fruit was more evenly distributed however when the raspberries were pressed into the dough the cookies looked more profesional but less flavoursome. Overall I think that this recipe is very good, the condenced milk does not seem to cause any problems and it only makes the dough a little softer than using eggs. I will try this again and recomend to others! Rated 4 out of 5 by Fleety from My go-to cookie recipe! This is a great recipe and the one I get the most requests for at work. I vary the recipe a little by chopping the raspberries up and putting four or five smaller pieces on the top of the slightly-flattened dough disks (making them look like uncooked mini pizzas!). My only problem with the recipe (hence the four stars) is that they become very brittle after only a couple of hours. Tried varying the cooking time/heat but I suspect the combination of butter, raspberries, chocolate and condensed milk will always make the mixture very prone to spreading and brittleness. Any suggestions? Rated 5 out of 5 by KKOO from SO YUMMY I cook these often and I cook them slightly less than they do in the photo as they are great a little bit squishy especially with out any egg! Rated 4 out of 5 by 1234 from Amazing I have really enjoyed making these cookies they were simple, easy and taste great! Rated 3 out of 5 by Higgledy from Watch the video I was in a mega rush to get these done (Valentines Day treat for the husband) so dived straight into the written instructions. I had noticed that it said serves 30, nor that there was an accompanying video. My advice would be that it helps to watch the video beforehand as the instructions are slightly different from the written steps. The written steps indicate that the dough should be placed on the baking trays as balls, but in the video they are flattened into an already cookie-like shape. "Small balls" of dough is obviously very subjective. I went with what my version of "small is" (considering it had to encase 2-3 whole raspberries). The end result? I have 12 rather large cookies that look more like collapsed muffins. They're currently cooling but I fear the inside might not be cooked enough. I added some chopped pistachios to the dough and I also used raspberries that I had previously frozen (instead of buying more). I think that I might do so again if I repeat this recipe in the future as it will help to stop them breaking up, or I'd pre-form the cookies and place raspberries on top, as shown in the video. Rated 5 out of 5 by Smith0054 from Tasted Lovely I have made these cookies a few times. Love the taste but on occasion they can be a bit too moist and this makes them very delicate and have a tendency to break up. I’m guessing that this is dependent on how juicy the raspberries are? Rated 5 out of 5 by Rosyk from They were a hit! My boyfriend and family loved them. I found the raspberry a little bitter so the second time I made them I made them without but still yummy!! !